Googlers search “user generated content” 9,900 times per month. If you’re a frequent flyer here at Orbit Media you know we geek out on that sort of data. Marketers search these keywords. Only marketers. That’s you? Sweet. You’re going to appreciate this post about a runaway train that has made you, me, your 7-year old niece, and 70-year old grandmother influential in the newly democratized world of online marketing. Because user generated content marketing is this century’s accidental marketing super force. What’s changed in media is who makes it. You do. If you’ve ever posted something on a website you don’t own, you’re contributing to the new world of user generated content marketing. Consumers now share their opinions and sentiments—non-stop—about the products and services they consume. They make comments, write reviews, post pictures and share via social media, blogs and the countless websites that invite users to contribute. In response, savvy marketers are tapping new platforms and new ways to inspire consumers to join the party. We are shifting from marketing at our consumers, to marketing with them. 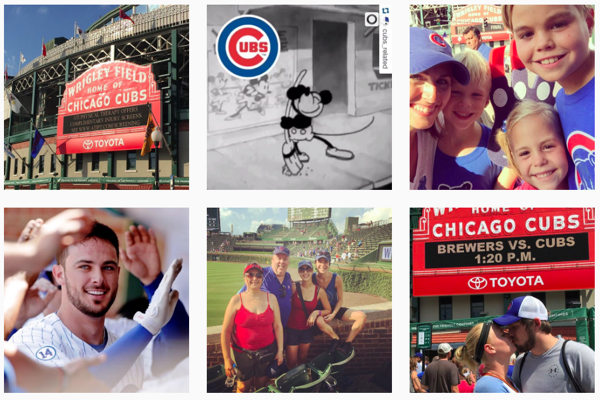 #CubsWin… search the hashtag anywhere hashtags are accepted and you’ll find fans are knocking it out of the park for the home team. The result? Influence. Trust. Sales. Speaks to your customers—Customers interact and share ideas related to your products, which builds community and helps address pain points. Creates creative content—Users get creative on your behalf and get even more enthused about your brand when they’re recognized for doing so. Generates organic buzz—Your products organically move from your site into the social streams and conversations of current and prospective customers. If you want to improve your reach and engagement, you’ll need to find ways to leverage user-generated content (UGC) since that’s what friends and family will see first. Of course, if you’re marketing 21st century style, you’re creating content. However, if you’re selling online, you now need to aim your arrows at ways to capitalize on user generated content marketing—especially if you’re selling to millennials, teens to 30-somethings. 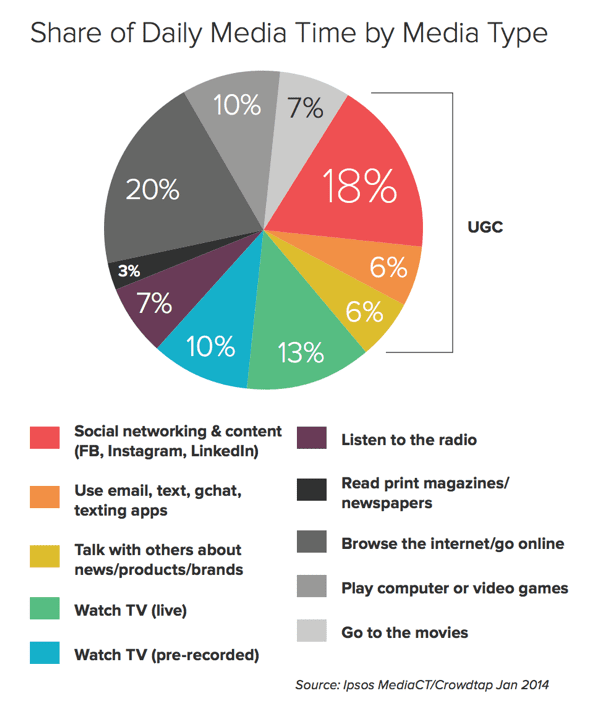 Millennials spend 30% of their media consumption time with content that is created by their peers (UGC). Marketers can “pay to play” in social media feeds with sponsored posts, but such tactics are perceived as ads (because they are) and are therefore less influential. The more effective strategy is to market with consumers by empowering them to post on your brand’s behalf. Which UGC is for you? Like most digital marketing, user generated content marketing doesn’t have a hard-fast playbook. It’s wise to examine what’s worked for other companies, but also smart to get creative and experimental. Images come to mind first for UGC types because people share billions of photos and GIFs on social media everyday. There are many ways to collect images from consumers that reflect your brand. Contests may be the best way. 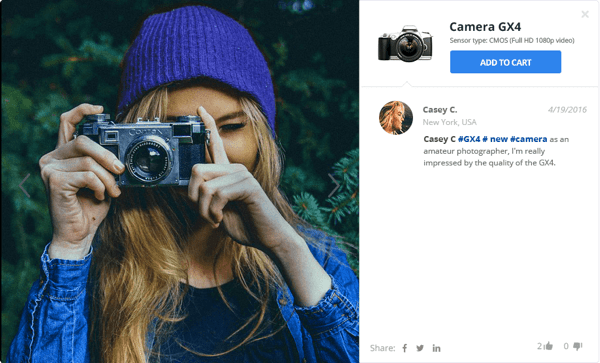 Yotpo has its eyes focused on a social curation tool eCommerce companies use to identify user generated content from Instagram and post it on product pages. The company claims eCommerce companies enjoy a conversion uplift of 180% by showcasing photos alongside reviews. Midtown Athletic Clubs asked readers to post photo of their yoga pose for the day (hashtagged #midtownyogalchallenge) and got some crazy cool content for their website and social feeds. Brands can leverage consumer-created videos in their marketing efforts in various ways. TV commercials often include clips from fans and consumers. Incorporating product reviews into a site gives consumers a voice and has proven to improve traffic, conversion rates and average order value. 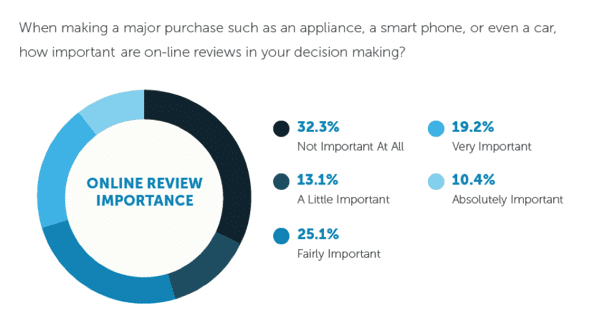 Research from Moz revealed online reviews impact 67.7% of respondents’ purchasing decisions. 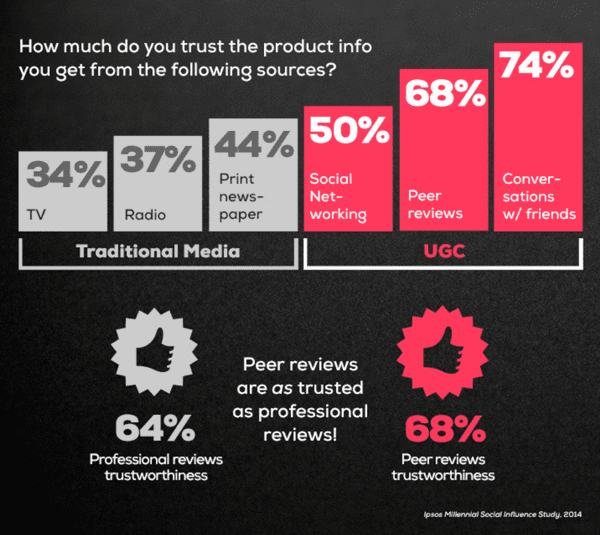 More than half of the respondents (54.7%) admitted online reviews are fairly, very, or absolutely an important part of their decision-making process. Comments on articles and editorial content within websites help to engage users and sometimes produce useful conversations and compelling debates. 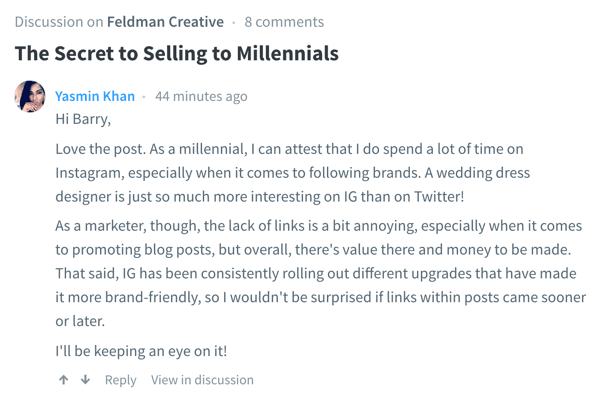 This just in: an interesting and thoughtful comment on my blog in response to another post about UGC, with a focus on selling to millennials via Instagram. Feedback and contest submissions on channels like Twitter is an excellent way for brands to solve problems, answer questions, and learn more about their consumers. Consider hosting a Twitter chat and ask users to respond with a specific hashtag. The content can be presented in a gallery, embedded on a page of your website, or curated in posts. You can harness the power of UGC to offer product support through a chat system, live Q&A program, or a forum, Allowing users to provide support can help to reduce demand on the company’s customer support system. Forums are a common form of UGC and foster community building. Surveys and polls compel visitors due to their simple, interactive nature. This type of UGC fosters goodwill as visitors feel they can have their say. 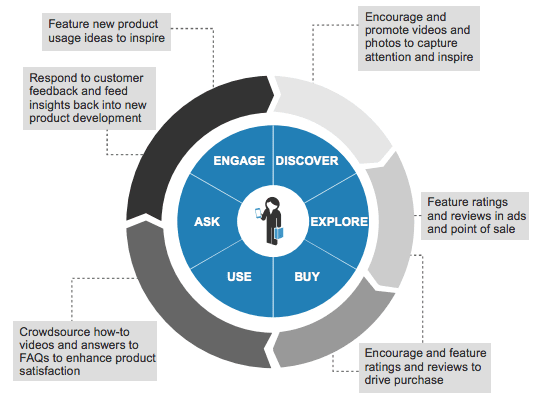 How-to’s and customer stories are popular forms of UGC and can deliver great value. Consider asking users to contribute articles to your blog or content hub. 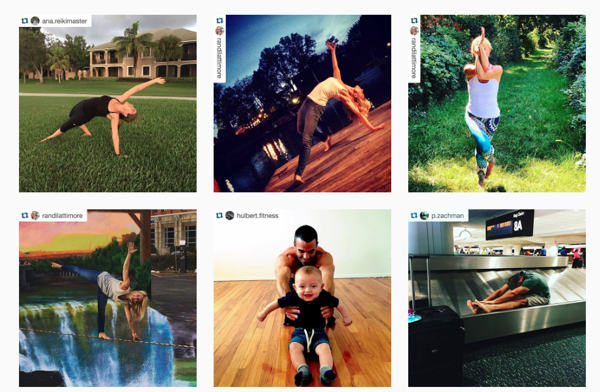 The most deliberate way to instigate user-generated content is to create campaigns based on #hashtags. By doing so, you’ll be able to track tagged messages from Facebook, Pinterest, Instagram, and Twitter. Make your hashtag short and promote it wherever possible: through social media, on your website, and traditional media too. Hashtag campaigns make customers feel connected to your brand, which boosts consumer engagement. 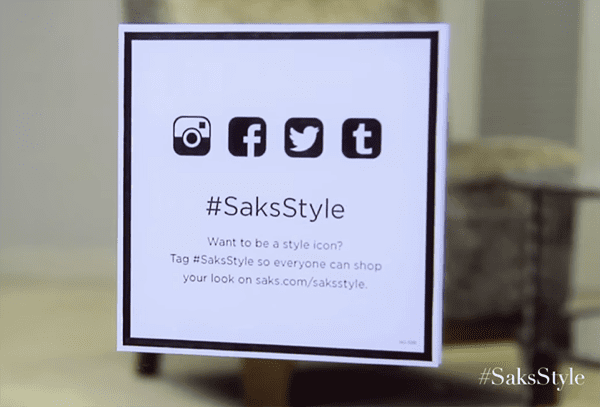 Saks asks, “Want to be a style icon?” This is a great example of using traditional media—in this case, in-store signage—to promote participation online with a hashtag. Happy customers are your most valuable marketing resource. Encourage them to provide content and use it all across your online properties. Brands, large and small, who make effective use of UGC, stand to gain a competitive edge. User generated content increases the authenticity of your content and helps create organic buzz around your products. Your marketing becomes more relevant and authentic. Got any ideas about UGC? Generate content right here and now in our comment stream. So can we assume if they share a pic with the suggested hashtag we have permission to repost it? Do we need some sort of disclaimer on our site about that? hey barry, I am working for a fashion brand and was wondering how do you calculate the opportunity cost of not tapping into my instagram potential. In other words what is the potential value of my instagram page if say I have 5000 images, 1million followers and say 2000 average likes on each post. Assume that AOV on my ecomm is $65. Now how do I calculate the revenue loss if I do not monetize my insta page?